The great families drove out Emperor Do-Gaigo in 1338 AD. Who was the Emperor Do-Gaigo? Then the new shogun was from the Muromachi family. Until about 1400, he and his sons and grandsons fought civil wars. They fought against the emperor’s supporters, and against the Hojo family. Even though the bubonic plague killed a lot of people in China and Korea in the mid-1300s, it didn’t really reach Japan. What was the Black Death like though? The end of Mongol control of China in 1368 AD, and the end of the Black Death, meant that Japan began to trade and visit with Ming Dynasty China and Korea again. The Ming Dynasty was doing exactly what Emperor Do-Gaigo wanted to do – redistributing land and weakening the rich people – but Do-Gaigo didn’t make it work. What happened to the Mongols? Why did rulers want to reduce inequality? What did Japan trade with China? 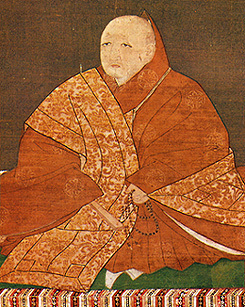 Ashikaga Yoshimitsu was the third shogun from the Muromachi family. He admired China’s power even if he wouldn’t or couldn’t redistribute land. He started to trade with China. (China called this Japan paying tribute to China and getting gifts in exchange.) Zen Buddhism came from China to Japan. Japan sent wood, copper, sulfur, steel, silver, and horses to China, and bought Chinese porcelain, silk, medicines, and books, as well as Silk Road things from further away. But, with the increasing use of the Chinese compass to find the way, Japan also traded more by sea with Southeast Asia for pepper, pearls, and perfumes, and through them with India and Iran for cotton cloth, sugar, glass bowls and plates, and ebony. With the end of the civil war, Yoshimitsu also reorganized Japan’s government. He sent out daimyo officials to enforce the law in each district (not unlike the Ming Dynasty government in China), and the three most powerful daimyo became the shogun’s main advisers. Yoshimitsu encouraged people to use Chinese copper coins, and the daimyo even collected some taxes in coins instead of in rice. But while the Ming Dynasty emperors succeeded in keeping control, the central government wasn’t strong enough in Japan. After Yoshimitsu died, it was the usual Japanese story: the shoguns pushed the emperors out of power, and the daimyos pushed the shoguns aside too. In the 1400s, even though there was still an emperor and a shogun, the daimyos held the real power in Japan. Then by 1467 the daimyos began to fight each other in yet another civil war. The central government was completely disregarded, and each district acted independently. But in the end, the land reforms had to happen, and they did happen, partly thanks to many revolts by the poor farmers demanding land redistribution and the abolition of debt. The old estates were destroyed, and new samurai became daimyos of smaller estates. These new daimyos defended the farmers in exchange for their work, but they also did surveys and redistributed land, built new roads, and opened mines that provided jobs. Debts were abolished. Many men also joined local armies. The new daimyo lived on their estates, instead of leaving them to go live at court. The new land-owners invested in more efficient farming, with better strains of rice and more fertilizer and irrigation. Buddhist monasteries did a lot of the things the central government wasn’t doing: settling disputes, regulating marketplaces, helping old people, providing health care, and protecting people’s rights. Now more people were richer than before. Japan was selling a lot of silver to China, which needed a lot of silver suddenly. And sea routes were open to the Vijayanagara Empire in India. China was using Indonesia as a trading center. So there was more trade and more traders. Merchants grouped themselves into guilds or unions. They got more power. By the early 1500s, the emperors and shoguns had almost no power, and there were a lot of small wars. But most people in Japan were better off. Cite this page: Carr, K.E. 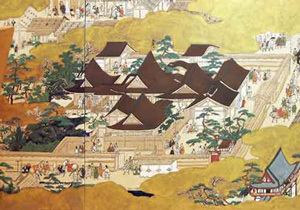 Muromachi – Late Medieval Japan. Quatr.us Study Guides, July 27, 2017. Web. April 21, 2019.